After an eventful week that saw Matt Lawrence move to Millwall followed by a 2-0 reverse at home to Wigan, Wycombe were on the end of another defeat when they travelled to Bournemouth. Second half goals from Wade Elliott and Scott Mean saw the Blues lose 2-0. There was better luck for Wycombe's Youth Team where two goals from Johnny Dixon plus a strike from Captain Ben Townsend earned a 3-1 victory at Portsmouth in Youth Alliance Division One South. Click here for Bournemouth v Wycombe report and OPTA stats. There was no activity on Deadline Day at Wycombe and Lawrie Sanchez will have to make do with the existing squad of players for the remainder of the season.. After the Wigan game Lawrie Sanchez praised the existing squad "The players have done tremendously well. The lads have come in and had a go and given their lot. I can't blame them it's not their fault we get beaten by teams like Wigan. I can't criticise any of those players tonight. They are all good lads and all the players that have come in has done the best he can. We aren't good enough for the teams at the top but we are good enough for the teams in and around us and Bournemouth are one of those teams, so we start again on Saturday and we will be looking to take the three points." Lawrie Sanchez has said that there will be no more players leaving Adams Park this season after the �0,000 gained from the sale of Matt Lawrence to Millwall helped 'balance the books'. Speculation has been rife that top scorer Sean Devine was about to leave but the Wycombe Manager said "Nobody else will be going before the deadline. With due respect to Matty, it's easier to find defenders and it's the lesser of two evils really" Sanchez went on to say "The Club can't be financed by the income it receives at the moment - it's a fact of life. Everybody knows that this Club is losing �0,000 per year. I'm the one at the end of the day that has to balance the books. Sometimes you have to take a step backwards to take a step forwards if that gives the Club six months breathing space to get in a situation where it can be stronger. The Chairman and The Board, I've got to give them credit, they are working behind the scenes solidly to try and improve the situation. It's all about resources." Reports came in late on Monday evening that Millwall have snapped up Wycombe right-back Matt Lawrence in a shock �0,000 move just three days before the transfer deadline. The news broke on Millwall Unofficial website House of Fun and indicated that the move was subject to a medical on Tuesday morning. On Tuesday the Official Millwall ClubCall line confirmed the report, saying that "Lawrence has been signed on a temporary basis with a view to a permanent move". They added that he was due to be in The Lions squad to face Wrexham on Tuesday evening. Wycombe have confirmed that the move will be made permanent on Wednesday, with the fee being �0,000 with two further installments of �,000 to follow. The deal also includes a 'sell on clause'. Lawrence was in his second spell at Wycombe having rejoined in October 1998 after an 18 month spell at Fulham. Originally moved to Wycombe in January 1996 from Grays Athletic for �,000 but was sold on to Fulham in February 1997 for a small fee. Wycombe had to pay �0,000 to get him back but he quickly established himself as a First Team regular. His popularity at Wycombe was emphasised when he was chosen by 'Friends of Chairboys of Net' as our sponsored player for the 1999/2000 season. Wycombe played Wigan Athletic for the fourth time this season when the Lancashire side travelled to Adams Park for a Division Two fixture but were on the wrong end of a 2-0 scoreline. After the game Sanchez said "The goal changed the game. It was a silly free-kick to give away, there was a mistake by Dannie Bulman in the clearance of it, they got a goal and all of a sudden they've got something to protect. It was unfortunate because at the time we were warming 'Bairdy' up to put him on. He was coming in anyway, it wasn't a reaction to the goal, he was going to come on and go for it for half an hour. The game plan was to hold them for an hour, chuck 'Bairdy' on and go 4-3-3 and see if we could nick something. We were asking too many people to do non-specialist jobs. You can get away it. We got away it against Stoke and against Oldham to some degree but you can't get away with it against quality sides. Against quailty sides you can't have two people playing out of position. It was a little like men against boys tonight. I would like to have given more of game. They've beat us three times now and drawn once and for 95% of all those games we've been as good as them." Click here for Wycombe v Wigan match details. Wycombe prevented Stoke City becoming the first side to do the double over of The Wanderers this season when they earned a creditable 1-1 draw at The Britannia Stadium on Saturday. Jermaine McSporran gave Wycombe a surprise lead on 23 minutes but Stoke equalised early in the second half from a penalty after stand in defender Lee Holsgrove had handled. Earlier in the season Stoke inflicted Wycombe's biggest ever Football League defeat at Adams Park when they scored four goals without reply. Click here for Stoke v Wycombe details and the latest OPTA stats. Wycombe's reserve side conceeded seven goals against second placed Queens Park Rangers at Loftus Road on Wednesday afternoon in the Avon Insurance Combination. Wycombe's only reply was a single goal from Dannie Bulman, while 'keeper Mark Westhead was carried off injured. Wycombe survived 33 minutes before conceeding and were only 2-0 down at the break after Rangers First Team regular Kevin Gallen converted. Gallen scored again seven minutes into the second-half when he crashed a far post ball straight into the face of Wycombe 'keeper Mark Westhead. The ball ended in the net while Westhead was carried off with a suspected broken nose. Rangers made it 4-0 on the hour mark before Wycombe had the consolation of scoring the best goal of the game - Bulman picking the ball up some 40 yards from goal before progressing forward and striking home from around 30 yards. Three more goals in the closing eleven minutes left the final score at QPR 7 Wycombe 1. Wycombe Team: Westhead (sub 55 Osborn), Townsend, Reeks, R Johnson, Leach, Gray, Lee, Bulman, Brady, Gostick (sub 83 Dash), Phelan (sub 67 Simpemba), subs not used Powell and Gibson. Ex-Wanderer Steve McGavin played for Colchester United reserves as the Essex side beat Wycombe 3-1 in the Combination game at Adams Park on Monday afternoon. A knee injury has kept McGavin out of the last few First Team games for Colchester following his scoring spree in Division Two. Wycombe fielded another young side with Alan Beeton the most experienced player as he returned from injury. The Wanderers fell behind in the 36th minute when Keeble scored for the visitors. Thomas Pinault made it 2-0 on 75 minutes before Dannie Bulman pulled a goal back when he latched onto a Ben Townsend cross - Bulman beating two defenders before seeing his partially deflected shot creep in. Colchester sealed the game with three minutes left through a Sean Hillier goal. Final Score Wycombe 1 Colchester 3. An injury hit Wycombe side had to settle for a point after a 0-0 draw with Oldham Athletic at Adams Park on Saturday (11th March). Wycombe's injury crisis got worse before the game when Sean Devine was ruled out with a groin strain. Wycombe now play five consecutive games against sides above them in the Division Two - starting with a trip to Stoke City on Saturday 18th March, before playing Wigan (home), Bournemouth (away), Gillingham (home) and Bristol City (home). Click here for Wycombe v Oldham match report and OPTA preview. 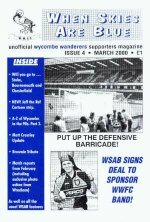 A new issue of Wycombe fanzine When Skies are Blue went on sale before the game with Oldham, priced � and should be on sale again before the Wigan and Gillingham games. Wycombe fans are also be given a Questionnaire issued by the Club with a view to gaining opinions ahead of the Club's proposal to bring in investors. Club Chairman Ivor Beeks wrote to members this week confirming that the Club had spoken to a number of people about possible new finance. The Questionnaire is available for viewing via The Official Wycombe Wanderers website. The Youth Team got their Second Phase merit matches off to a winning start on Saturday with a 2-0 victory over Exeter City at Molins Sports Ground. Roger Johnson opened the scoring on 6 minutes when he headed home from close range following Lewis Cook's free-kick from the right wing. Leeyon Phelan notched his 13th goal of the season after 22 minutes when he side-footed home after Ian Simpemba had pulled the ball back at the far post following another Wycombe move dwon the right. The Youth Team make the long trip to Plymouth next Friday for their second game in Southern Merit Division One. Click here for full fixture list. Wycombe's Reserve side lost 4-2 at Swindon Town on Wednesday afternoon in the Avon Insurance Combination after leading 1-0. The Wanderers went ahead on 31minutes when Mo Harkin played a low ball in from the right and Richard Thompson touched the ball home at the near post. However, the lead lasted just three minutes after Quinn scored for The Robins following a free-kick. Two minutes later Worrell had put the home side ahead and the game was put out of Wycombe's reach by further goals by Cuerve (54) and Forhner (71). Wycombe scored a consolation goal with twelve minutes left on the clock when Harkin's quick free-kick from the right was headed home from 12 yards by Danny Senda. Wycombe Team: Westhead, Reekes, P Johnson, R Johnson, Gray, Harkin, Lee, Thompson, Senda, Brady subs not used Gostick, Osborn, Simpemba, Phelan, Powell. The Reserves have two Combination games scheduled next week - on Monday (13th March) Colchester United are the visitors to Adams Park while on Wednesday the team travel to Queens Park Rangers. Both games are scheduled to kick-off at 2.00pm. In front of crowd of more than 8,000 at Bristol Rovers Memorial Stadium, Wycombe were defeated by a single goal to the current League leaders. Injury hit Wycombe were still without defender Paul McCarthy who picked up a thigh injury during training last week and missed the 2-2 draw at Cardiff. McCarthy could be out for two weeks. Keith Ryan also missed the trip to Bristol having suffered a knee injury in the game at Ninian Park. However, Sean Devine, who was forced off in the second-half at Cardiff with a suspected groin strain, recovered in time to partner Andy Baird in the Wycombe attack. Lee Holsgrove made only his second League start of the season, with Mo Harkin unable to retain his place in the starting eleven. The only goal of the game came after ten minutes when Nathan Ellington flicked a header past Martin Taylor. Wycombe survived a barrage of Rovers pressure before the break and lost Andy Baird two minutes before the break after a high challenge from Rovers Andy Thomson. Wycombe's best chances of snatching a point came during the second-half but the home side were content to sit on their lead. Click here for extended Bristol Rovers v Wycombe match report. The Youth Team's first 2nd Phase Merit match due to be played on Saturday against Wolves was postponed due to a waterlogged pitch at Molins Sports and Social Club. A new date has yet to be arranged. Last Sunday (27th February), two members of the Wycombe Youth Team scored when they appeared for a FA Youth XI against the Combined Services at Portsmouth. Leeyon Phelan and Roger Johnson both scored during the 3-0 victory at Portsmouth while Ian Simpemba also played. Wycombe have signed up three more players on three-year scholarships. They are Jack Smillie (15 year old son of ex-Wycombe Manager Neil Smillie), Johnny Dixon, Lewis Cook and Pat Lynott. 15 year-old schoolboy Dixon has scored four times for Youth Team this season. A group of Wycombe fans joined fellow football followers from all around the country on Thursday in a lobby of Parliament to urge MP's to adopt the majority findings from The Football Task Force and to support the Fans' TV Charter. Both these issues are being raised in the Early Day Motion 243 which has already been signed by over 100 MP's. The lobby was arranged by The Coalition of Football Supporters which is an 'umbrella' group formed last year with representatives from both the National Federation of Supporters Clubs and the Football Supporters Association. For more information see the FSA website. The Reserves lost 2-0 to Norwich City on Wednesday afternoon in the Avon Insurance Combination. A goal six minutes before the interval from ex-Manchester United trianee Michael Twiss put the visitors ahead before Mike Milligan's deflected shot sealed the game in the 70th minute. In a fairly uneventful game, Wycombe gave 19 year old Hull striker Lee Ellington a run out in a blue shirt but chances were limited for the 5' 10" former trainee at Boothferry Park. Wycombe Team: Westhead (sub 45 Williams), Reekes, P Johnson, R Johnson, Holsgrove, Lee, Harkin, Bulman, Ellington, Thompson (sub 68 Senda), Brady (sub Gray 83) subs not used Leach and Gostick. The Berks and Bucks Semi-Final with Reading has now been confirmed for Tuesday 11th April at Adams Park - kick-off 7.45pm. Sean Devine went into the Club record books as his hat-trick in the 3-0 victory over Bury took him to 19 goal Football League goals in a season - one better than Miguel Desouza's previous seasonal best for a Wycombe player. Devine opened the scoring five minutes before the break and after that Wycombe didn't look back. Bury saw Martin Taylor save an injury time penalty from The Shakers Player/Manager Andy Preece as Wycombe kept a clean sheet for the second game running. After the game Lawrie Sanchez admitted "I thought we were very poor for the first half an hour to be honest and it was only our back-four that kept us in the game. We tried something a bit different and it didn't work and I've got take responsibility for that...we switched back to 4-4-2 and the lads were happy with that" Sanchez also paid tribute to Devine "I expected him to get 25 goals this season and he's got 21 and he's got 14 games left..he could end up with 30 goals and he's well capable of doing it." With Wycombe now edging towards safety, Sanchez added that "Hopefully soon we'll be able to give people chances like Mo Harkin. Dannie Bulman and Matt Brady and people who have been on the fringes. The ten minutes Mo was on the pitch he looked like a world beater"
Unless stated Wycombe Wanderers pictures used on Chairboys on the Net are with kind permission of Paul Dennis (LRPS) and should not be reproduced without prior agreement.